So this healthful supper looks like 'love', doesn't it? Yes? Please? You see, it's my contribution to Hooked on Heat's From My Rasoi's love-themed cooking extravaganza. Love? What's a plate of potato and peas and pepper and ridge gourd (and what's a ridge gourd anyway?) got to do with love? Love. Hmm. Expressed in Indian food. Sure, I could have Googled, even asked around. I could have pulled out a long-neglected cookbook, Classic Indian Vegetarian and Grain Cooking by Julie Sahni. But what I really (really really) wanted to make was the ridge gourd curry that showed up on Mahanandi more than a month ago. You know how some times a dish just grabs your attention? And even when a thousand other recipes try to intercede, your mind is somehow stuck? Thanks to Indira's coaching, I already had the Thai peppers (and have been throwing them into most everything) and the coconut powder. All I needed was the ridge gourd -- and lucky me, they're a dog-walk away. And the truth is ... I ♥ Indian food blogs. I love the simple combinations of vegetables and spices. I love the feeling of culture and community. From One Hot Stove to Mahanandi to Food, in the Main to Hooked on Heat to Sailu's Kitchen to Anthony's Kitchen to My Dhaba to The Cook's Cottage ... and on and on ... I feel inspiration. So that's the story. So now you know. I love Indian food blogs. And that's the reason I cooked a simple and satisfying supper to express 'love'. KITCHEN NOTES ... This vegetarian/vegan supper was filling and satisfying. I substituted red pepper for carrot (how does one run out of carrot?) and curry powder for currry leaves but otherwise followed Indira's recipe faithfully. And the whole wheat chapatis? Wonderful! WHAT's A RIDGE GOURD? A ridge gourd may look unusual (to me, to others too?) but isn't the least scary for, let's say, North American palates. It has the texture of spongy summer squash, the wetness midway between a zucchini and a cucumber, and the mild sweetness of a chayote (a Veggie Venture discovery on Day 221, which just this week I learned from Shammi is called chow-chow!). It's easy to peel with a carrot peeler and is good to eat raw -- perfect for a plate of raw vegetables. And if Wikpedia is right, it's unmature fruit which, if left to mature and then processed becomes luffa, the stuff that softens our skin! 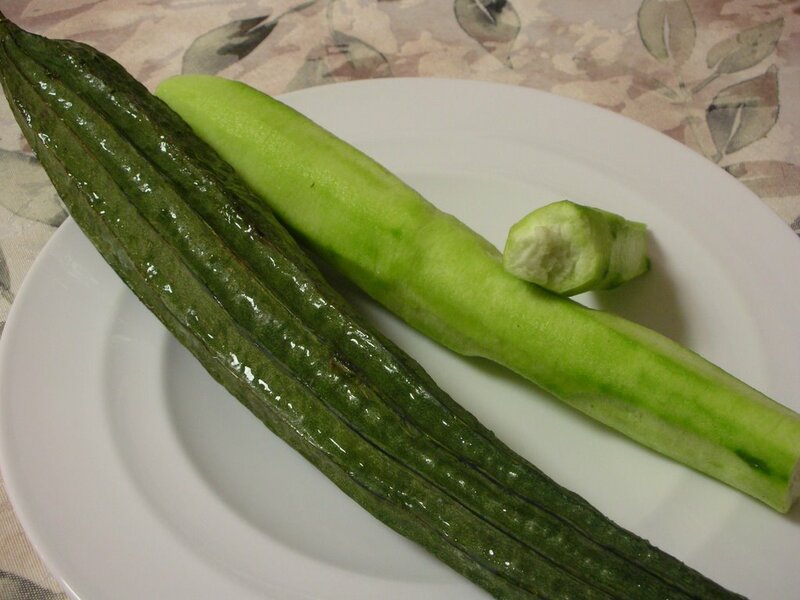 If you can't find ridge gourd, no problem. Substitute zucchini or summer squash or chayote. FROM THE ARCHIVES ... Curries have become such favorites that they have their own section here in the Recipe Box. In a large, deep skillet, heat the oil over MEDIUM HIGH until shimmery. Stir in the garlic, mustard seed, cumin and curry and let heat til the seeds begin to pop and the spices become aromatic. Stir in the onion and let cook til just beginning to soften. Add the potato, carrot, the soaked peas and a splash of water. (I found this was needed to keep the potato/vegetables from sticking.) Reduce heat to MEDIUM, cover and let cook until both potatoes and carrots are nearly done, about 20 minutes, stirring occasionally. While the potatoes cook, peel and dice the ridge gourds and mash the chilis and coconut powder into a smooth paste (I used a new mortar and pestle, which did the trick). Add the turmeric and salt (so you don't forget!). Stir the ridge gourd and chili/coconut paste into the potato mixture and let cook for 5 - 10 minutes, stirring occasionally. 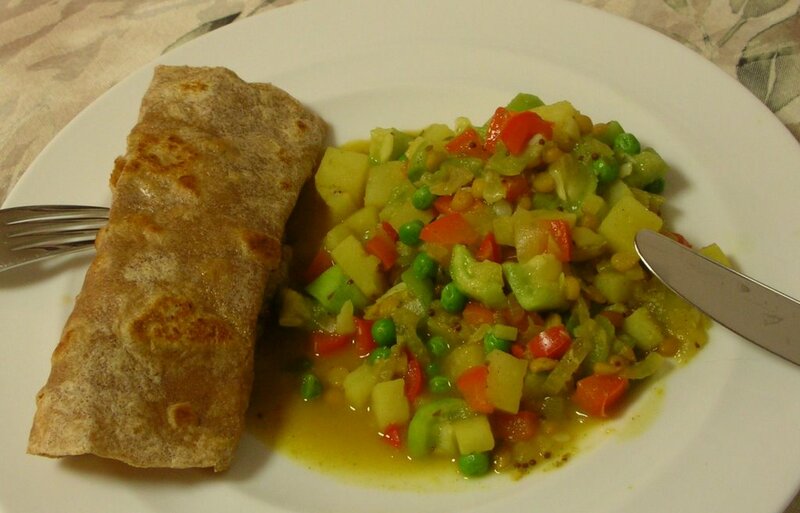 (During this time, there was five minutes to spare, just enough to pan-heat the chapatis!) Taste and season appropriately. Serve and much enjoy! Will have to cook up something special and veggie for you... You would love the Mustard Green saag i cooked too.. Thanks for the Ridge Gourd info!